In this Laboratory the magnetotransport properties (resistance, magnetoresistance, Hall effect) of various materials (low dimensional conductors, oxide heterostructures,...) are investigated. 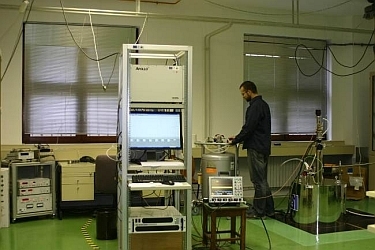 Microwave absorption research has been conducted at the Faculty since 1997., and the Laboratory has been expanded in 2010. to include nuclear magnetic resonance methods. The principal research subjects are collective phenomena which determine matter properties such as superconductivity and quantum magnetism. Additionally, trough nuclear magnetic resonance measurements, the Laboratory participates in other areas of condensed matter research such as ionic conductors, ferromagnetic graphite, soft matter, metal cluster alloys etc. 7. Ana Najev, mag. phys. 9. Petar Kolar, mag. ing. The Laboratory investigates the micro-structure of modern materials. It is equipped with an X-ray diffractometer for polycrystalline samples, and a high-resolution transmission electron microscope, along with a complete sample preparation setup. In this Laboratory, we conduct the synthesis of amorphous materials, metallic glasses, nanocrystalline alloys, polymers, high-temperature superconductors and, most recently, high-quality monocrystals of various types of topological insulators with superior properties (low charge carrier density and high mobility), as well as potential topological superconductors necessary for the detection of new physical phenomena anticipated in topological insulators. The synthesized samples are characterized by structure, transport, thermodynamic and magnetic properties measurements. The current equipment includes several ovens (up to 1600 °C), a differential scanning calorimeter (100-830 K), a helium refrigerator (10-400 K), a cryostat with a 10 T magnet (1.7-400 K), and an RF device, along with the necessary setup for measuring transport, thermodynamical and magnetic properties. 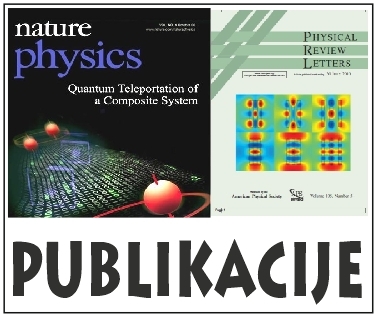 The principal research interests of the Laboratory are the development of new materials, the investigation of collective phenomena (superconductivity and magnetism), weak localization, spin-orbit interaction and spin scattering in metallic glasses, phenomena that arise as a consequence of Dirac dispersion, the spin momentum locking effect, and the π-Berry phase of topologically protected metal sufrace phases. Special emphasis is put on the development of highly sensitive methods for measuring magnetization - using a piezo-resistive micro-cantilever, heat capacity and thermoelectrical effects. The detectors prepared and tested in this laboratory are used for fundamental research in experimental nuclear physics conducted in accelerator centers MAMI (Mainz Microtron), Germany, DAFNE (Laboratori Nazionali di Frascati), Italy, and CERN, Switzerland. The laboratory is also engaged in the application of nuclear methods: materials, medicine and environment. Research in experimental particle physics at high energies focuses on the investigation of quark-gluon plasma at the Relativistic Heavy Ion Collider (RHIC) and Large Hadron Collider (LHC), as well as the nucleon spin structure at the RHIC. Research conducted in this laboratory is directed towards the investigation of atomic and molecular processes in high-pressure discharges, low-temperature plasma properties, and the interaction of atoms and laser light with alkaline vapor or ionized gas. In this Laboratory the magnetic and electrical properties of various materials are investigated, including static magnetization and AC susceptibility, electrical transport in magnetic fields and magnetic properties in electric fields. This enables the study of magnetic ordering and dynamics in nano-magnets, interactions in various complex materials, critical phenomena in superconductors and magnetics, magnetoelectric effects along with numerous other interesting occurrences of modern physics. The investigated systems include magnetic nano-particles, magnetic-ion complexes, organic magnetic materials, multiferroics, superconductors, alloys, complex magnetic structures and other materials of importance for basic and applied physics. 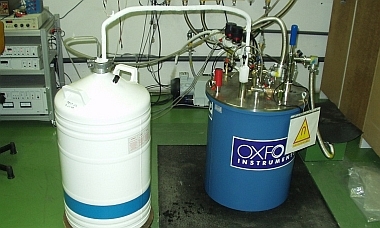 The Laboratory equipment includes a SQUID and a vibrating sample magnetometer, an AC susceptometer and the instrumentation necessary for electric transport measurement, which enables precise and exhaustive measurements of magnetic and electric properties in a wide range of temperatures (2-1000 K) and magnetic fields ( up to 18 T), appropriate both for basic characterization of new materials and detailed studies of interesting phenomena. Observational astrophysics applied to galaxy formation and evolution. The Group is active in educational research in physics, which includes the investigation of conceptual and mathematical difficulties encountered by pupils and students in the understanding and adoption of basic physics concepts, research in the field of educational neuro-science, as well as the development and testing of novel educational strategies and physics teaching supplies. The group is also active in the development of the physics classes curriculum, school laboratory physics experiments, and the construction and evaluation of educational physics examinations according to the Rasch model. An important aspect of the Group's activity is the collaboration with elementary- and high-school teachers, and the regular seminars and workshops organized for them. We use neurodynamic methods for functional brain imaging, magnetoencephalography (MEG) and electroencephalography (EEG), the investigation of sensory and cognitive processes, multisensory integration and cortical plasticity in basic and translational research, including studies from the area of educational neuro-science. Along with the empirical MEG investigation we use numerical simulations in order to gain insight into the accuracy and precision of parameter determination depending on the model and approach used for monitoring the dynamics and topology of cortical networks. Due to the lack of an MEG laboratory in Zagreb, we conduct our measurements in cooperation with the Los Alamos National Laboratory (LANL), MIND Research Network and UNM, Albuquerque, NM, BioMag Laboratory, Aalto University, and MEG laboratories in Heidelberg and Jena (TU Ilmenau).